Want to know how Iceland landed on everybody’s bucket list? This dreamy video shows you exactly why. With this compilation of dramatic drone footage, we set out to prove that Iceland’s dramatic landscapes are too beautiful for words. We're not the first, of course—Iceland’s accidental travel ambassador, Justin Bieber, shot his wanderlust-worthy music video for “I’ll Show You” among Iceland’s fjords and verdant valleys. Many people fly into Reykjavik to dine at Perlan, or sample fermented shark fin at the fish market. But the country’s greatest attractions lie outside of the capital city. Take a journey to Iceland to frolic, Bieber-style, across the moss-covered lava fields, or take a dip in the healing, mineral-rich Blue Lagoon. 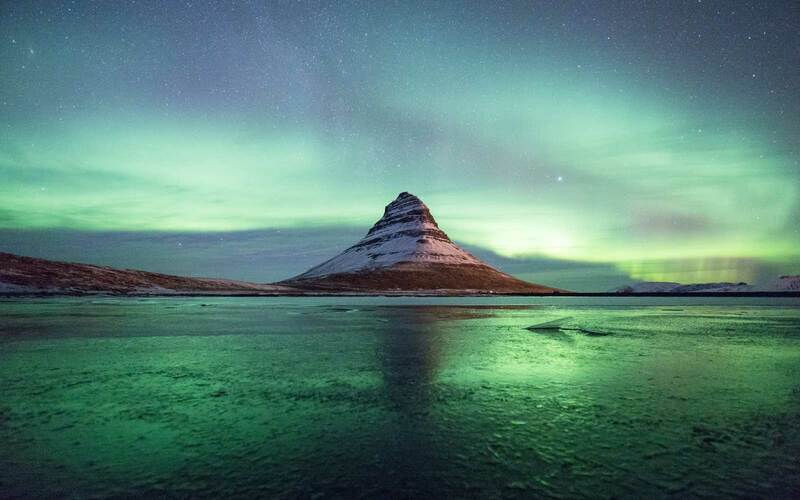 Travelers considering a vacation to Iceland should note this is definitely a country for road trips—you’ll want to drive the 80 miles around the tip of the Snæfellsnes peninsula, home to a glacier-topped volcano, wild horses, and basalt cliffs. Afterward, trace the Golden Circle to see Geysir (the original geyser from which all others get their name) the Gullfoss waterfall, and the fissure where the North American and Eurasian tectonic plates meet: it’s the only place in the world to see this above the ocean. Other sights include the abandoned husk of a U.S. Navy airplane resting on a black sand beach, and an ancient crater filled with pure rainwater. Steaming hot springs and active volcanoes rise up alongside ancient glaciers, impossibly blue ice caves, and waterfalls that spill over the country's jagged edge. But the only way to truly appreciate Iceland is to see it for yourself. Go in the winter to avoid high season crowds (and prices that match) and to try winter-only experiences like ice caving and glacier hiking. And in the summer, you can enjoy virtually endless daylight and venture out to see locals' favorite sites, including Glymer waterfall and lengthy hikes through the rhyolite mountains of Landmannalaugar.